When I was a kid my mom and dad would take my sister and me on road trips. I remember at different times driving with my family from our home in Texas to Maine or Colorado or Michigan and many other wonderful places within the United States. I really loved these trips. Not only did I get to spend quality time with my family it was these trips that whetted my appetite for travel. I remembered thinking then that if I could visit all fifty states I would have really accomplished something. I would be a traveler. As a family we covered a lot of ground but completing the task would take more time, travel to all 50 states requires some effort. When I became an adult I continued enjoying travel in the United States but as I started visiting other parts of the globe my wanderlust grew even stronger. I loved having new experiences, seeing new sights and having a little more insight into different cultures. Directly experiencing different parts of the world made me feel more empathetic, aware and connected, but I also encountered something interesting back home; there were a few cranially constipated cynics who wanted to confront me, with chest proudly puffed out, with the fact that they didn’t own a passport – as if somehow that made them a better American – and they didn’t intend to get a passport until they had seen all fifty states. I found their attitudes a bit myopic, considering they rarely went anywhere beyond the local Wal-Mart, certainly xenophobic and in some cases subtly racist, but in the back of my mind I wondered, even though their attitude was cloaked in willful ignorance and false patriotism, if perhaps they had a minor point. It nagged at me. I was recently in the US taking care of some unfortunate business and got the idea of turning this otherwise perfunctory trip into a celebration of sorts and reaching my goal of having been in all fifty states! While talking on the telephone with my friend Scott, who is always up for an adventure, I mentioned my idea and pretty much without hesitation, he said, “Where do I fly into and when do we start?” Within a week we were in a rented bright red Volkswagen Jetta on our way from Portland, Oregon to Houston, Texas. In order for me to make fifty states we had to hit Idaho, Montana, North Dakota and South Dakota. Other than crossing those state borders we had no real plans, no reservations and not a lot of ideas. We knew there would be some interesting scenery along the way – you know, little things like Yellowstone National Park, Glacier National Park, Mount Rushmore, the Cascade Mountains, the Rocky Mountains and maybe, possibly a few interesting watering holes – but, we had no expectations. To make a long post short, we did it! 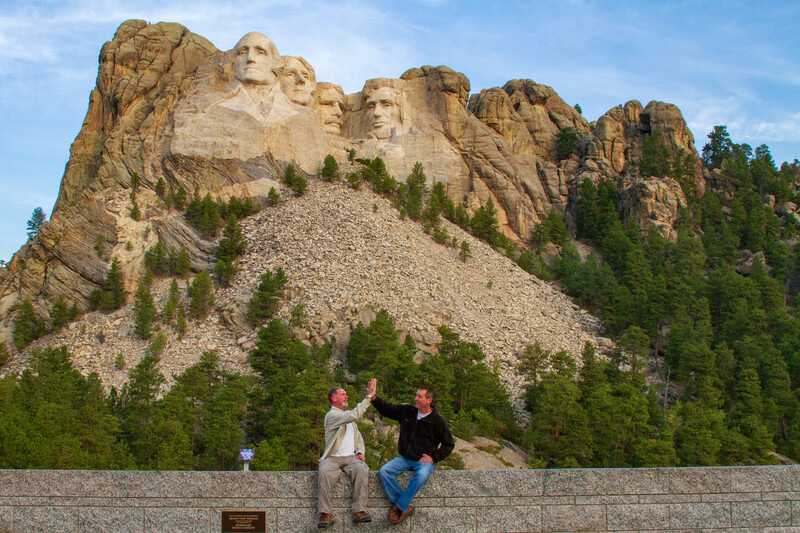 Late in the evening on September 11, 2012 we crossed into South Dakota. I have now been to all fifty of the states in the United States of America. I will write more about a few of the places we went later. It was an amazing trip and even though I am not a person that cares too much about going someplace just to say I have been there, it was a proud accomplishment.